Jump inside the imagination of one unforgettable little girl who likes to pretend she's babysitting her daddy, when really he's looking after her! Children will adore following along as she turns the tables on her dad William, but always sees his potential. When he grows up he could be an astronaut or a lion tamer or a famous chocolate maker, but his most important job is being her Dad. (And possibly being an astronaut, if she can come too. 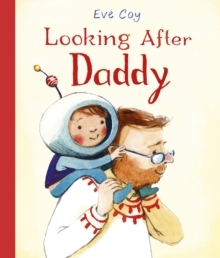 )This uplifting tale of a stay-at-home father and his daughter is guaranteed to melt your heart.